Guild archtop guitars, like this 1985 X-170 Amber ‘Mini Manhattan’ built in Westerly Rhode Island, have been popular with jazz and blues players for decades. The X-170 was introduced in 1985, and produced until 2002. 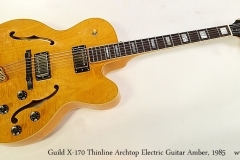 The roots of Guild archtop guitars go back to a labour conflict at Epiphone during 1951. Unable or unwilling to come to terms with the workers, management moved production from New York to Philadelphia. Many of the New York craftsmen moved to the new Guild company founded by Alfred Dronge, a music store owner and George Mann, a former Epiphone executive. 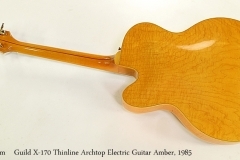 The company naturally focused on archtop models, but by the 1960s electric and flat top acoustic guitars were the higher-selling items. The Guild F-412 and F-512 jumbo 12-string models are still some of the best built 12-string guitars. The X-170 uses maple laminates for the body to reduce feedback, and this example has a very nicely flamed set for the top, back and sides. For bracing, there are two long bars running from the neck to tail blocks, and an approximately two inch wide, half inch thick sound post or block under the bridge. The neck is maple with a typical Guild walnut center strip, and bound rosewood fingerboard with block, mother of pearl position markers. The finish is a very nice amber-tinted clear gloss, in good shape except for the top. The top has a number of marks that do not show clearly in the photos – or in person, until you’re within a foot or so, some of which are too deep to buff out. These marks do not appear on other parts of the guitar. This guitar plays well, and is strung with Dr. Thomastick 12-50 flat wound strings providing a full, smooth tone. The finish is in good shape with a bit of marking around the pickup selector. The case has been replaced with a newer arched-top model likely by TKL.